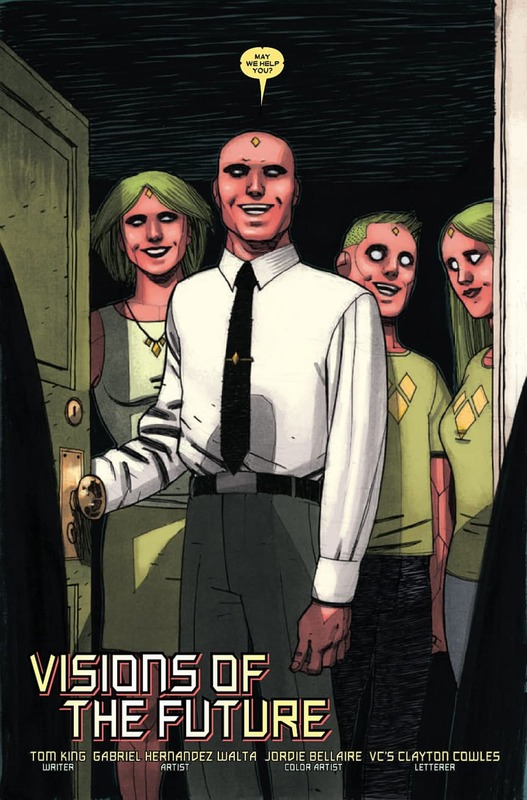 The Vision, the Marvel superhero and "synthezoid" who has spent years fighting alongside the Avengers (saving the world no less than 37 times by his own estimation), has chosen to create a family in order to continue his quest of becoming "normal." He crafts a wife named Virginia in the same way he himself was created (using the brainwaves from a human), and by combining the two of their brainwave patterns (remember, it's comics), they also bring forth their twin children, Vin and Viv. They move into a new house in the Virginia suburbs of Washington, D.C., where Vision works as a liaison to the President. Their children, created as teenagers, need to attend a local high school in order to learn how to work with humans, and Virginia is waiting to hear back about job opportunities in order to keep herself occupied. Everything seems to be going well at first, until a villain unexpectedly drops in while Vision is away. And from that moment on, everything goes downhill. The Vision is not a traditional "superhero" comic book. In fact, there is little to no heroism in it at all. If anything, it is a family drama writ large and taken to an absurd level. 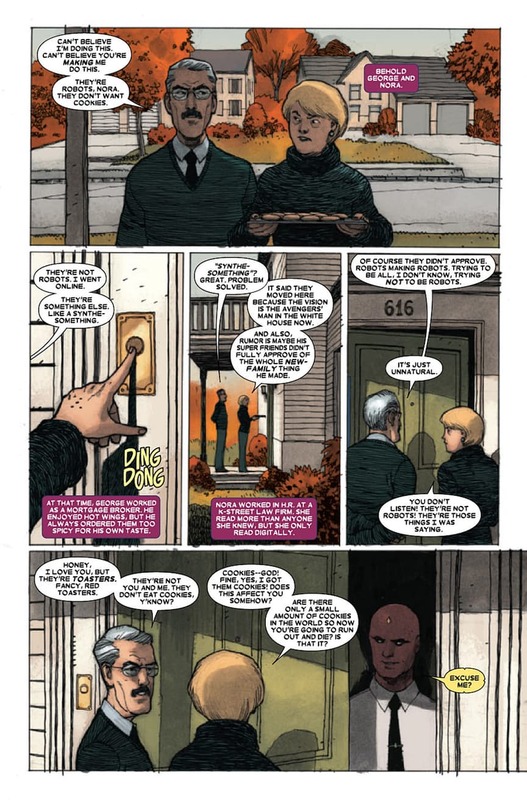 Despite an appearance by Iron Man and references to a plethora of past events and characters, The Vision has very little to do with the larger Marvel world, and it is this distance and its sincere exploration of its dark subject matter that allows it to surpass its genre by leaps and bounds. It isscience fiction, suburban drama, and post-modern horror all wrapped into one. Walta's art and Bellaire's coloring make for an effective combination that properly sets the tone of the piece. The Visions do not have pupils, making all of their expressions seem distant and haunting. No matter how much they play dress-up, their eyes and mannerisms constantly betray their true identities. The art style is realistic, with no exaggeration and often muted colors, as if the artists were in on their deceit by trying to downplay their strangeness and make the characters blend in better with their surroundings. In the end, it only makes their differences even more striking, which is the intended effect. The art is so normal, in fact, that when traditional superheroes or villains appear in their outfits, it's appears silly and out of context. But it also means that when the horrible things begin to happen, they are given more weight than a normal "soap opera" superhero comic could offer. 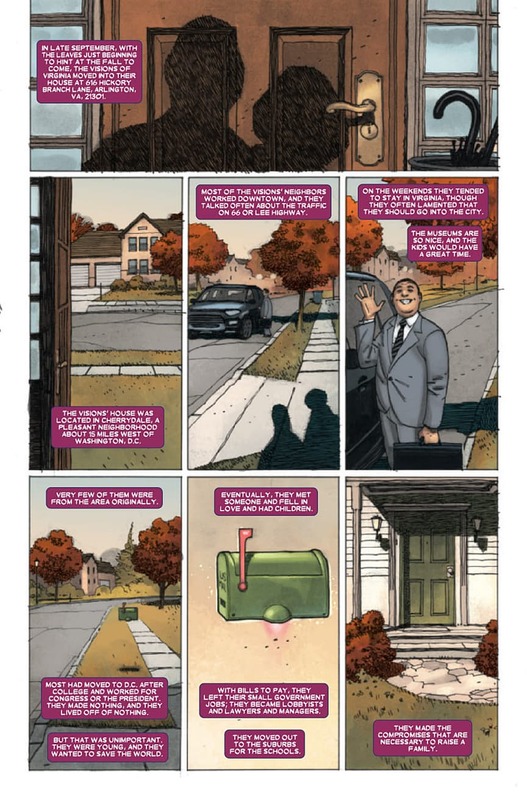 Writer Tom King crafts a smart script, often incorporating framing devices, call-backs, and motifs throughout the book in order to accentuate his themes. In other words, there's a lot more literary attention paid to this than your typical comic monthly. What are the Visions? Are they man or machine? What is ordinary, and what does it mean to be normal? Like a Greek drama, Vision is the cause of his own misery, and his obsession with "normalcy" becomes his hubris and leads to his downfall. This book is straight tragedy, and one that continues to peel back the layers of the Vision and his family until the inevitable conclusion. We know where this is going from the first few pages, and like a car crash we can't turn away. It's brilliant. It's terrifying. It's bold. And it's something that Marvel has needed for quite some time. Superhero comics have been around for so long that they have tread every genre, trope, and plot point several times over. Even The Vision contains elements of pieces we've seen before. But this comic is more than the sum of its parts, and King and Walta's book is a remarkable masterstroke that rises above the white noise of the "big two" publishers. I would argue that this limited series will be lauded for years to come. This comic isn't for everyone: there are some pretty heavy moments, and a segment in the last section that disturbed me on a very deep level. But if you think you can handle it, I highly recommend picking this up. We'll definitely be looking at the second volume and conclusion soon.